Eastman was born at/in Waterville, Oneida County, New York. He was the fourth and youngest child of George Washington Eastman and Maria Kilbourn, both from the bordering town of Marshall. His third sister died shortly after her birth. In 1854, his father established the Eastman Commercial College in Rochester and the Eastman family moved to Rochester in 1865. Two years later, his father died and Eastman left high school to support the family. He began working as an office boy by the age of 14. In 1874, Eastman became intrigued with photography but was frustrated by the awkward process. It required coating a glass plate with a liquid emulsion, that had to be used before it dried. After three years of experimentation with British gelatin emulsions, he developed a dry photographic plate, patented it in both England and the US, and began a photographic business in 1880. In 1884, he patented a photographic medium that replaced fragile glass plates with a photo-emulsion coated on paper rolls. The invention of roll film greatly speeded up the process of recording multiple images. Eastman received a patent in 1888 for his roll film camera. He coined the marketing phrase "You press the button, we do the rest. "The phrase entered the public consciousness, and was even incorporated into a Gilbert & Sullivan operetta (Utopia, Limited). The camera owner could return it with a processing fee of $10, and the company would develop the film and return 100 pictures, along with a new roll of 100 exposures. 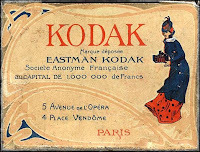 On September 4, 1888 Eastman registered the trademark Kodak. The letter "O" had been a favorite of Eastman's, he is quoted in saying, "it seems a round, endless sort of letter". He and his mother devised the name Kodak with an anagram set. He said that there were three principal concepts he used in creating the name: it must be short, you can not mispronounce it, and it could not resemble anything or be associated with anything but Kodak. By 1896, 100 Kodak cameras had been sold. 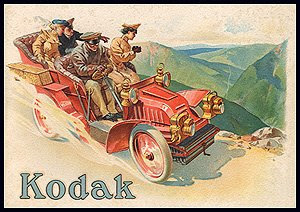 The first Kodak had cost USD $15. The pocket camera now cost $0.50. In an effort to bring photography to the masses, Eastman introduced the Brownie in 1900 at a price of just $1. It became a great success. In 1925, Eastman gave up his daily management of Kodak, to become chairman of the board. He thereafter concentrated on philanthropic activities, to which he had already donated substantial sums. He was one of the major philanthropists of his time, ranking only slightly behind Andrew Carnegie, John D. Rockefeller, and a few others, but did not seek publicity for his activities. He concentrated on institution-building and causes which could help people's health. He donated to the University of Rochester, establishing the Eastman School of Music and School of Dentistry; to Tuskegee Institute; and made major donations to the Massachusetts Institute of Technology (MIT), which helped build several of their first buildings at their second campus along the Charles River. During his lifetime, he donated $100 million, mostly to the University of Rochester and the Massachusetts Institute of Technology (under the alias "Mr. Smith"). The Rochester Institute of Technology has a building dedicated to Mr. Eastman, in recognition of his support and substantial donations. He endowed the Eastman School of Music of the University of Rochester. MIT has a plaque of Eastman (the rubbing of which is traditionally considered by students to bring good luck) in recognition of his donation. Eastman also made substantial gifts to the Tuskegee Institute and the Hampton Institute. Upon his death, his entire estate went to the University of Rochester, where his name can be found on the Eastman Quadrangle of the River Campus. His former home at 900 East Avenue in Rochester, New York was opened as the George Eastman House International Museum of Photography and Film in 1949. On the 100th anniversary of his birth in 1954, Eastman was honored with a postage stamp from the United States Post Office. Eastman had a very astute business sense. He focused his company to making film when competition heated in the camera industry. By providing quality and affordable film to every camera manufacturer, Kodak managed to turn all competition into more business.